The field of bone- and cartilage regeneration has evoked strong interest in tissue engineering. Osteogenic and chondrogenic differentiation potential of adipose derived stem cells (ASC) are challenging and promising for bone- and cartilage repair. 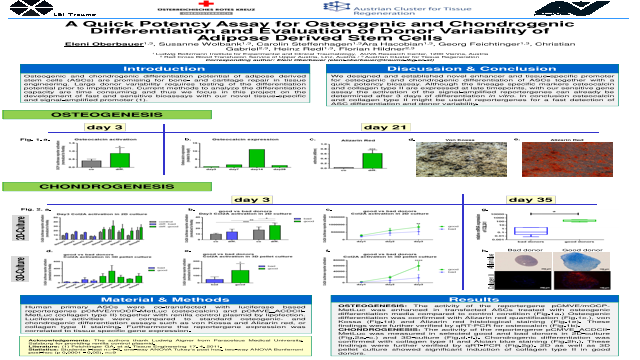 Current in vitro methods to analyze the differentiation capacity and to evaluate good and bad donors are time consuming and thus we designed and established novel enhancer and tissue-specific promoter for osteogenic and chondrogenic differentiation of ASC together with a quick potency bioassay. Osteocalcin or collagen type II promoter was coupled to a strong viral enhancer for signal amplification. Human primary ASC were co-transfected with luciferase based reportergenes pCMVE/mOCP-MetLuc (osteocalcin) or pCMVE/mACDC-MetLuc (collagen type II) together with renilla control plasmid. For transfection, a mild lipofection was applied and a green fluorescence protein (GFP) control was included to assess transfection efficiency. Secreted metridia luciferase allows to measure promoter activation in the supernatant without need of cell lysing. Luciferase activities were compared to standard assays such as Alizarin red staining for osteogenic differentiation or collagen type II staining for chondrogenic differentiation. Additionally, the reportergene expression was correlated to tissue specific gene expression. The activity of the reportergenes was enhanced in transfected ASC treated with osteogenic or chondrogenic differentiation media compared to control condition. Previously evaluated good and bad donors corroborate with the results of our quick potency assay. Osteogenic differentiation was confirmed with Alizarin red quantitative and histological stainings whereas chondrogenic differentiation was confirmed with collagen type II staining. These findings were further verified by qRT-PCR. Although osteocalcin and collagen type II are late markers, the activation of the signal-amplified and sensitive reportergenes can already be determined after 3 days of differentiation in vitro. In conclusion osteocalcin and collagen type II might be useful reportergenes for a fast detection of ASC differentiation.